Keep The One Who. . .
You’ll know they’re “the one”, when they discover who you truly are and are equipped to dive deeper. 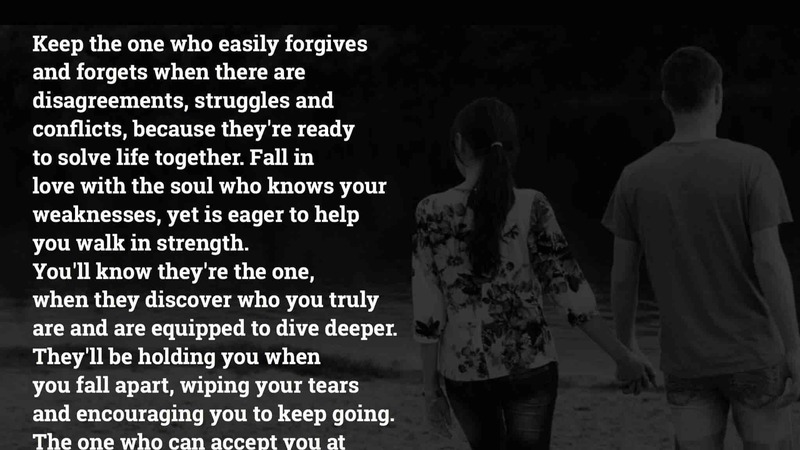 They’ll be holding you when you fall apart, wiping your tears and encouraging you to keep going. The one who can accept you at “rock bottom” and help you climb back to “the top”. Keep the one who knows how to make you laugh when you feel like crying, makes ordinary days feel extraordinary, leaves sweet notes out of the blue to make you smile, reminds you of your greatness, keeps life real, kisses you softly on your forehead, takes your hand in just the right secure way, and makes love to your mind. Someone you can make memories with, even when the power goes out. They are your cheerleader when you feel depleted; your healer when the world is tough; and your comedian when you need a laugh. Let that person be your sounding board when in doubt, and your inspiration when you are exhausted. Hold onto them tight. Remember it’s rare to find someone who will love you beyond the good times. Love them with the fierce passion that is needed to keep a relationship strong. Above all, always keep your love moving through each other. You two will always be changing, such is life. But a forever love overcomes changes, adapts, and keeps going. Remember, relationships are like two foreign hearts coming together to create a new language of love. Be patient. You must keep in mind… you will fall in love with this person over and over. Even at the lowest moments, when you second guess your love, resolve it and look for a reason to fall in love again. This is the cycle of a real relationship, one that lasts forever.